Breastmilk substitute. For bottle & combination fed babies. 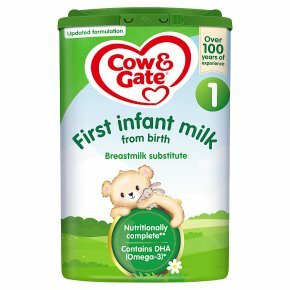 Cow & Gate first infant milk is a nutritionally complete breastmilk substitute suitable from birth. It can be used for combination feeding or if baby is not being breastfed. What's Next? Sitting, clapping, crawling - as they do more, they need more. From 6-12 months your little one will be developing new skills at an amazing pace. Our follow-on milk can help support your baby's changing needs at this special time in their development, as part of a varied, balanced diet. Feeding guide 0-12 months Approx. age: Up to 2 weeks, Approx. weight: 3.5kg, 7 3/4lb, Preparation for single feeds: No of feeds per 25 hours: 6, No. of level scoops per feed (1 scoop = 4.5g): 3, Single feed: 90ml, 3fl.oz Approx. age: 2-4 weeks, Approx. weight: 3.9kg, 8 1/2lb, Preparation for single feeds: No of feeds per 25 hours: 5, No. of level scoops per feed (1 scoop = 4.5g): 4, Single feed: 120ml, 4fl.oz Approx. age: 4-8 weeks, Approx. weight: 4.7kg, 10 1/2lb, Preparation for single feeds: No of feeds per 25 hours: 5, No. of level scoops per feed (1 scoop = 4.5g): 5, Single feed: 150ml, 5fl.oz Approx. age: 8-12 weeks, Approx. weight: 5.4kg, 12lb, Preparation for single feeds: No of feeds per 25 hours: 5, No. of level scoops per feed (1 scoop = 4.5g): 6, Single feed: 180ml, 6fl.oz Approx. age: 3-4 months, Approx. weight: 6.2kg, 13 3/4lb, Preparation for single feeds: No of feeds per 25 hours: 5, No. of level scoops per feed (1 scoop = 4.5g): 6, Single feed: 180ml, 6fl.oz Approx. age: 4-5 months, Approx. weight: 6.9kg, 15 1/4lb, Preparation for single feeds: No of feeds per 25 hours: 5, No. of level scoops per feed (1 scoop = 4.5g): 7, Single feed: 210ml, 7fl.oz Approx. age: 5-6 months, Approx. weight: 7.6kg, 16 3/4lb, Preparation for single feeds: No of feeds per 25 hours: 5, No. of level scoops per feed (1 scoop = 4.5g): 7, Single feed: 210ml, 7fl.oz Approx. age: 7-12 months, Approx. weight: - kg, - lb, Preparation for single feeds: No of feeds per 25 hours: 3, No. of level scoops per feed (1 scoop = 4.5g): 7, Single feed: 210ml, 7fl.oz Assumes weaning at 6 months. Your baby may need more or less than the deeding guide above. This information is given as a guide only. Consult your healthcare professional if you require more advice. Always use the scoop provided, please note the colour of the scoop may change from time to time. How to prepare Because powdered milks are not sterile, failure to follow instructions may make your baby ill. 1 Wash hands and sterilise all utensils according to manufacturer's instructions. 2 Boil 1 litre of freshly run water. Leave kettle to cool for 30 minutes and no longer. Measure the required amount of water (refer to feeding guide) into a sterilised bottle. Be careful of scalding. Do not use artificially softened or repeatedly boiled water. 3 Using the scoop provided, level off the powder with the built in leveller. Do not press/heap the powder. 4 Add one scoop to every 30ml (1 fl.oz) of boiled cooled water. Never add extra scoops or anything else your baby's feed. Cap the bottle and shake well (for 10 seconds) to dissolve powder. Remove cap and replace with a sterilised teat. 5 Cool under running tap. Check temperature of feed. Feed immediately. For hygiene reasons, do not store made up feeds. Make up each feed as required and always discard unfinished feeds within 2 hours. If necessary, offer cooled boiled water between feeds. Do not heat in a microwave, hot spots may occur and cause scolding. Important notice<br>Breastfeeding is best for babies. Cow & Gate first infant milk should only be used on the advice of a doctor, midwife, health visit, public health nurse, dietitian, pharmacist or other professional responsible for maternal and child care.<br><br>Dental advice<br>When bottle feeding do not allow prolonged or frequent contact of milk feeds with your baby's teeth as this increases the risk of tooth decay. Ask your healthcare professional or dentist for advice. Make sure your baby's teeth are cleaned after the last feed at night.<br><br>Never leave your baby alone during feeding.